Global Health is about everything that affects the health of all us wherever we live. We are interconnected and interdependent in health globally, just as we are in every other area of our lives. This is seen most obviously in the rapid spread of infectious diseases globally, the global market for health professionals and the environmental changes that affect populations across national boundaries; but it also affects health policy, science and the growth in non-communicable diseases and much more. One World Health and the recognition that our shared problems need shared solutions – described in One World Health (2016) and elsewhere. The focus in this section is on global health and there are related themes described elsewhere in this site on Health and Health Systems; Global Health in Parliament; and Nursing Now!. In 2006 Tony Blair asked me to look at what the UK could do with its experience and expertise to support health in developing countries. 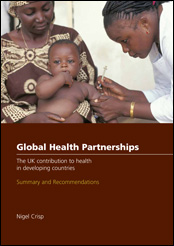 Global Health Partnerships (2007) sets out three broad conclusions and makes recommendations about developing more equal and respectful partnerships – all of which were designed to help move away from the then prevalent top-down and one way ideas of international development. The report concluded that: the UK and other rich countries should stop telling poorer countries what to do and, instead, support them in what they know needs to be done; rich countries can learn a great deal about health from poorer ones without their resources and vested interests; there are many different ways to work effectively together, embracing technology and much more. Successive UK Governments have adopted most of the recommendations into policy with, for example, the successful Health Partnerships Scheme. Turning the World Upside Down (2010) describes what richer and poorer countries can learn from each other and has been very influential. Described on publication by Lincoln Chen of the China Medical Board as “a decade before its time” and in 2017 by Chelsea Clinton in the New York Times as being as relevant today as at the time of publication. 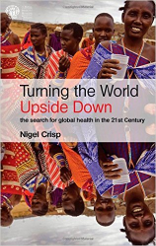 The book discusses health in rich and poor countries in the same way, not treating them as totally different, and develops further the idea that co-development and mutual learning should replace outdated ideas of international development. It complements this with a new vision for global health, and our rights and accountabilities as citizens of the world. It argues that rich countries import trained health workers from poorer ones (the brain drain) and export their ideas and ideology about health to them, whether or not they are appropriate or useful. What, I ask, if we were to turn the world upside down – and poorer countries exported their ideas and experience whilst richer ones exported their health workers? More information about Turning the World Upside Down. Most accounts of health in Africa are written by Europeans or Americans. This book redresses the balance. Edited with Francis Omaswa, it is written by Africans who have led improvements in their own countries, it contains remarkable stories about community participation in health in 1970’s Kenya; describes nurses undertaking caesarean sections and other procedures as successfully as physicians; and shows how Universal Health Coverage is being developed in different countries. 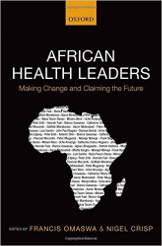 It describes and celebrates these achievements and records how, over three generations, African health leaders are creating a distinctively African vision of health and health systems. It describes what Africa needs from the rest of the world as it develops and how Africans can share their insights and knowledge and contribute fully to improving health throughout the world. It also illustrates how African leadership can enable foreign agencies and individuals working in Africa to avoid the misunderstandings and misinterpretations of culture and context which can lead to so much wasted effort and frustrated hopes. I co-chaired the Task Force on Scaling Up Education and Training with Bience Gawanas, Commissioner for Social Affairs for the African Union and wrote up this report Scaling Up, Saving Lives (2008) with her and Imogen Sharp. It was published by the World Health Organization and supported by the Gates Foundation. The report presents evidence of previous scaling up initiatives around the world – designed to educate more health workers – and provides guidance on how best to replicate these examples on a larger scale. It sets out a 10 year programme and suggested educational methodology that could be adopted by any country that was seeking to scale up a balanced workforce. The report is part of a wider set of programmes promoted by the Global Health Workforce Alliance in response to the global crisis in human resources for health. I was a member of the Lancet Commission chaired by Julio Frenk and Lincoln Chen which wrote Health Professionals for a New Century (2010). 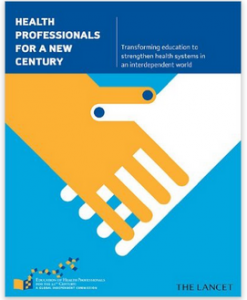 This report describes the many changes underway in both the health environment and professional education concluding that the new era in education needs to be systems and team based and to develop professionals capable of being transformational leaders. It suggests the ways in which the content, methodologies and institutions of professional change need to change in order to transform education to strengthen health systems in an interdependent world. The report was published 100 years after the Flexner report which brought a scientific basis into medical education and with its emphasis on systems as well science is becoming increasingly influential particularly in South East Asia. 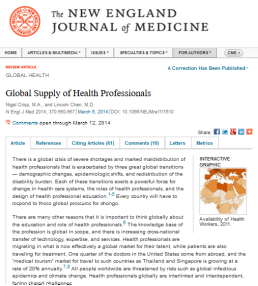 This article written with Lincoln Chen and published in 2014 provides an authoritative overview of the supply of health professionals globally. It was part of a series of articles in the New England Journal of Medicine on global health which have now been collected in a book (Hunter D J and Fineberg HV: Readings in Global Health; OUP, December 2015). The article points to both global shortages and maldistribution of health workers globally – between richer and poorer countries and between rural and urban areas. It discusses their causes – located in three great global transitions – and reviews some of the actions necessary to redress these balances and move towards the goal of providing people everywhere in the world with access to a trained health worker and the health services they need. One World Health (2016) is about the issues that affect the health of us all wherever we live. Its central thesis is that we need to understand better the things that unite and divide us: our increasing interdependence, our shared risks and vulnerabilities, the shared opportunities and the need for shared action; but also the divisions, inequalities, and the way in which social structures both globally and more locally affect health and opportunity – for better or worse. There is a positive dynamic around health with the Strategic Development Goals providing global direction, new emphasis on health promotion and disease prevention, new investment, and advances in science and technology. 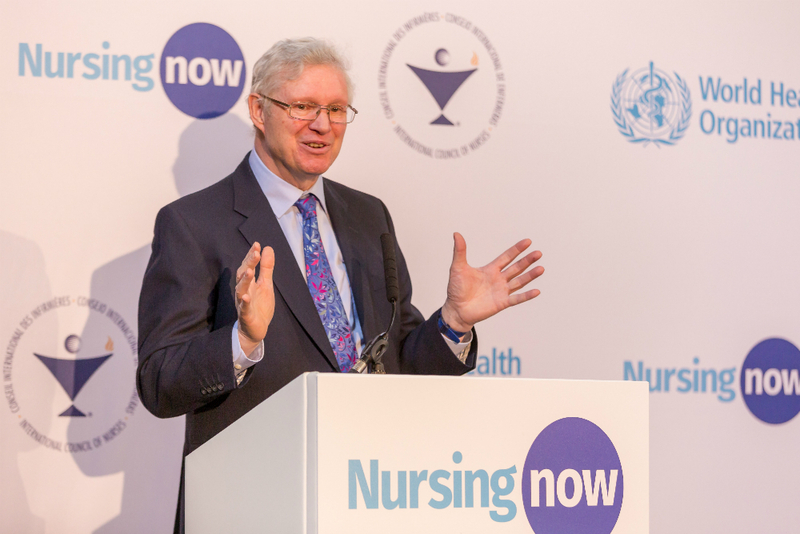 There is also a negative dynamic – with increasing conflicts globally, fragmented provision, growing inequality, environmental pressures, new diseases and resurgent old ones, cost constraints and growing shortages of health workers. 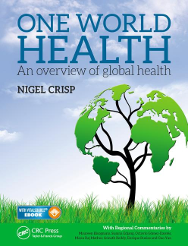 This book provides an overview globally with 5 regional commentaries written by health leaders in India, China, Africa, North and Latin America.